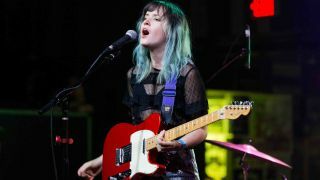 If you think Mariel Loveland looks, and indeed, sounds familiar, that would be down to her role as Candy Hearts vocalist/guitarist, where she was responsible for some of the past five year’s most dangerously addictive pop-punk earworms. Now undergoing a personal re-imagining of sorts, surfacing as Best Ex, Loveland has adopted an indie-pop approach that yields a fresh six-string take on her hook-heavy songwriting. 4. Is there a guitar, or a piece of gear, that you regret letting go? “This is pretty grim, but once I threw up and swallowed it because I didn't want to be seen puking on stage in front of 500 people. It was pretty rough. Sometimes if I don't eat enough or drink enough before a set and it's really hot, I get some sort of nervous system reaction where I almost faint and/or vomit. Ice Cream Anti Social is out now via Alcopop! Records.